"Our mission is to educate others in preventing health challenges. W﻿e do this by providing information and offering solutions." 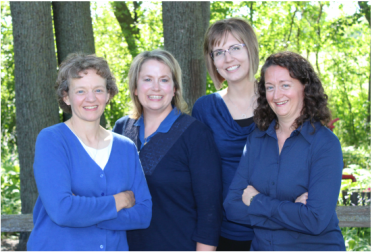 Cornerstone Health Team was developed because four Health Educators saw a need. The need was prevention before the health challenges became serious. They all noticed a common thread while working with others ~ an ounce of prevention would have been worth more than a pound of cure. Many of those whom they helped did not understand the functions of very important parts of the body or that the body had been sending very loud and clear signals letting them know something was about to go wrong with their health. With a great desire and combined experience of forty-five years of working with others, Anita, Brenda, Leticia and Maria developed educational and fun presentations focusing on ‘listening to your body when it talks’. Their ultimate goal then became not only to help others deal with current health concerns but to help prevent them. In an effort to reach out to as many people as possible they decided to start by educating. Their first class, Basics of Reading Your Body, was developed to help others understand how the body works and listen to the signals it sends. Every class is designed to be fun, with a hands-on approach to learning that the body sends different signals and how to understand them. With lots of products, services and companies out there that specialize in helping treat symptoms, Cornerstone Health Team’s mission is different. They want to help others prevent health challenges and live at an optimal health level. Join the Cornerstone Health Team movement today - Our Mission is Focused on Prevention. Find a class near you! Knowledge is Power!